Arturo Fuente hand-rolled premium cigars carry a personal family touch that makes them the finest cigars in the world. Each of the handmade cigars listed below in our Classic Series is Dominican made manufactured and crafted by the Fuente family for four generations. Blended with tobaccos grown exclusively on the Arturo Fuente family farm, these premium cigars are mellow to medium body infused with binders and fillers from the Dominican Republic and bundled up with rich tasting Cameroon, Connecticut and Ecuadorian Sungrown wrappers. Once you ignite an Arturo Fuente hand-rolled premium cigar you will experience a mild-strength smoke that is remarkably rich and satin smooth. 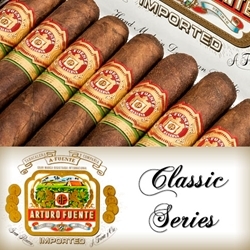 If you looking for an excellent cigar smoke at a great price, the Arturo Fuente Classic Series are hand rolled premium cigars that deliver time and time again. Smokers Discounts has made it easy and affordable to buy premium cigars online. A variety of sizes and flavors are listed below at our discount online cigar store. Each of these styles are in stock and available. Call us for more details!